Welcome To America, Land of the Skyhawk! My grandfather recently sent me some of his old rally and ice-racing photos, and I'll get around to scanning and posting them one of these weeks. But looking at those yellowing shots of Saab 93s and oval-window Beetles sliding around on frozen Lake Minnetonka got me to thinking about all those millions of family photographs out there showing interesting old cars from Back In The Day, and how maybe I should ask our readers to start sharing theirs... and, as if on cue, here comes this email from BZR, who has discovered some photos of his father's very first car. 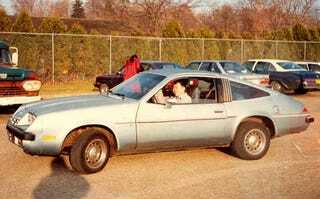 Yes, after arriving from China, the first-ever car BZR Sr. owned was a 10-year-old '76 Buick Skyhawk! Which, when you think about it, is as good an introduction to American culture as you're ever going to get from an automobile. Make the jump to read the whole story in BZR's own words. My father came to America in 1985 to get his master's degree and eventually his Ph.D. Like most immigrant sob stories, he came with only 20 bucks in his pocket and a young wife at home. Through typical hard work and the Horatio Algeresque belief in the American dream, he eventually attained his master's degree in engineering at the University of Wisconsin-Madison...but in the meanwhile, he had to get around somehow. So in 1986 he had amassed enough money to buy my mother a 747 ride to O'Hare airport, which being the loving and devoted mother that she was, she accepted. But my father needed transportation! Something he could have never had in China, as it would have been too costly and crowded and prohibitive even during Deng Xiaoping's economic reforms. So after learning to drive from a friend in what I assume was a hilarious and terrifying manner, he settled on the car we have here. A 10-year old, 1976 Buick Skyhawk. God only knows how many miles were on that cantankerous tank, its 110-hp V6 crammed next to the archaic optional 3-speed manual in the same way chickens are in slaughterhouses. He paid 400 bucks in cash for it and promptly drove it across the country, where he discovered that the AC was broken. Not something you would have wanted to find out when it overheats in Iowa in July. He drove it to conferences and interviews with his friends from his apartment in Wisconsin, all the way to California, Louisiana, and Connecticut. Judging by the reputation the H-bodies had, he must have been massively brave or had balls of steel. One day, presumably a few months before I was born in late 1987, it was impounded by the fine members of the Madison police. So naturally, he tossed the keys in a trash can and never looked back. And alas, that's how it ended up in the terrifying jaws of the Crusher, turned into toilet float valves or Chef Boyardee cans. Your first car should always have your best memories, your definition of freedom, encapsulating the best times of your life. I'm reminded of the Home Improvement episode when Tim Taylor goes on a hunt for his original Corvair convertible and ends up seeing it crushed before his very eyes, which would understandably bring a man to tears if he was the right kind of man. Fast forward 20 years. I'm sitting in the computer lab of Syracuse University, browsing my fair homepage of Jalopnik.com when I start thinking, "wouldn't it be great to have an old Yank Tank like what apparently populates every square inch of Alameda?" Then I suddenly have a flashback: I'm sitting on my daddy's knee as a tender young boy of 5, browsing through a huge maroon photo album. The pages are thick and heavy with washed-out photographs of naked relatives and smiling men in front of generic monuments. But one photo always stuck out to me. It was a nondescript faded-blue sedan on dog-dish hubcaps: big enough, I thought when comparing it to the backseat of our Mirage with its automatic seat belts, to swallow our entire school. The fuzzy details meant that it was big and imposing, just the kind of car my mild-mannered father wouldn't have. Thoroughly unsensible. I loved it. So I emailed my dad asking about it. I had heard the story of its disappearance multiple times, and was well-familiar with the tried-and-true method of leaving the burden of disposal to the City of Madison Police Department. Yet the details I had gotten about it were scarce: it indeed did have a V6 (which after further research was the only engine offered in the 'hawk) and was light blue. So I was close. I told him to email any pictures he could find and my mother obliged, but never got around to it. Fast forward...to today, March 24th. After breaking the key to my infuriating mailbox lock in half, the stub end mysteriously popped out and I pilfered my roommate's key to obtain the care package my mom had sent me. Socks. Mostly socks, socks, and more socks. Luckily I had been running low anyway. Yet it was just the beater I would have imagined it to be, the type of junker a struggling foreign grad student would have bought during those difficult first years. The door panels carried the dings and dents of countless Kroger parking-lot injustices, while the paint had impressively faded to an even tone throughout. I wasn't surprised to see that the door didn't line up properly with the rest of the car, but that would probably be GM's problem. The pseudo-dog-dish, pseudo-mag wheels originally must have been gold in color, like a precursor to Subaru's infamous WR Blue paint scheme. What really blew me away, however, was the hood pinstriping - what style! What class! A callback to a bygone era, when men were men and cars wore their decal packages with brazen abandon! A glimmer of hope in an era of choking smog regulations. In the first picture, my dad sat grinning in the seat of power, surrounded by Chevettes and what could have been a Peugeot wagon and a hulking GMC truck that looked just as out of place as it would have today. A spooky reflection lingers in the right, a red car's reflector and a mysterious, smartly-dressed figure lingers behind the aluminum-colored pillar. My mother looked pretty in the second picture, in a bright red robe that I had never seen her wear before, one hand confidently on the inevitably decaying roof. I can conquer the world, her pose says, reminiscent of anything Madison Avenue would have come up with. I used to think I could have it for a first car, that I could make a pilgrimage back to Madison and find it still sitting there 20 years later like Fry's dog, weathered but with the last remnants of dignity the Malaise Era GM engineers had phoned in when it left Lordstown. But it's safe to say that he's gotten over it; we've replaced it since with a Dodge Colt hatchback, a turd-beige 1988 Ford Taurus, a flaming tomato red Mitsubishi Mirage that he plowed into the back of a Grand Cherokee on a business trip, and a whole host of other modest machinery. But the Skyhawk would always stick in my mind as a pastiche of ironic '70s Malaise...who knows? My parents' 25th anniversary is coming up in a few years, so aside from the cruise I have planned for them (shh, don't tell them) I might try my luck at rescuing one from the unforgiving jaws of the Crusher and bring it back to life for them. It'll be a gift my dad probably won't be too happy about (how many people are truly attached to their Pontiac Astres? ), but I'll end up with the Malaisemobile I've wanted for a while. It's unrealistic to believe that the car would have survived the ravages of rust, iron oxide, and Masshole drivers to survive to this day, but it's always fun to dream of what could have been.